'BUCCANEER' BOARD GAME: The idea of the game is to collect treasure to a total value of 20 points made up by adding the value of the last cargo brought to the player's Home Port to that of any treasure already there - whether in the Safety Zone or in Docks. A player collects treasure by sailing his ship from his Home Port to visit Treasure Island where the draw of a chance card may give him treasure or crew, or to another Port for trading, or to attack another ship. On attacking an opponent's ship, treasure or crew are taken by the winner - the one with the greater fighting value. Fighting value is therefore important for defence as well as attack. 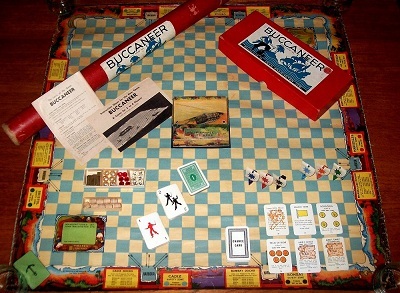 Quite possibly the most sought after vintage board game of them all, Buccaneer has been treasured by generations of board game enthusiasts for almost eight decades. That it still remains in production (the latest edition being inspired by the Hollywood film Pirates of the Caribbean) confirms the enduring playability of this family classic. Although there are now a number of early editions available, it is difficult to find an example that is complete and in good condition - and of course the older the edition, the more difficult this becomes. And so you will appreciate what a rare find it is to come across a first edition of this game that is in both complete and very good condition. This is a beautifully presented game and there is a lot that could be said about the stunning appearance of the contents: six ships each sporting a wooden mast and hand-painted paper sail; the quality crew and illustrated chance cards; the metal-backed glass rubies and diamonds, shiny pearls, metal gold bars and authentic wooden barrels - all of which look excellent. But perhaps the most striking feature of this game is the cloth-backed canvas map that replaces the conventional rigid board. It is very large and is in very good condition for its age. It comes with the original cardboard tube and, in keeping with the traditions of that era, the game contents are housed in a separate box, which itself is in great condition.